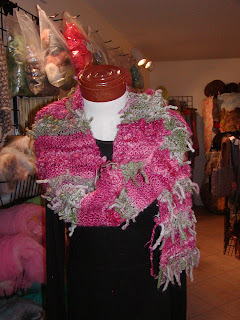 This is a scarf made by Sharon Pettus using my yarns. She put them together in a way that I would not have thought of and it turned out gorgeous. I got her permission to post the pictures I took. 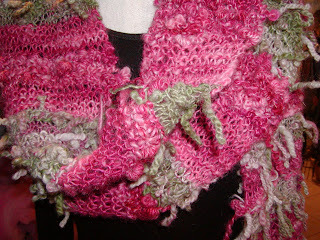 She alternated the coiled yarn with a simple single and a creation of my own that I call spun lambs tails. Can't wait to see what she does with the last batch of yarn! Penny came to shear on the 6th and we harvested 14 fleeces. Marc had a discussion with me that same weekend about the cost of feed and actual income from the fleeces. Turns out, that I will have to spin the Shetland, if I want to break even on their feed. 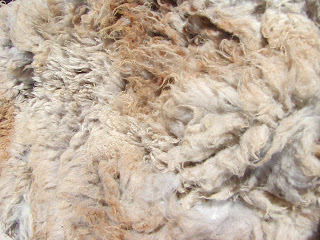 The mohair sells at a high enough rate, once it has been washed, to cover the cost of the goat's feed. If the sheep are not producing offspring, I end up in the hole. Economics is not my favorite subject! This is the fleece off the last Shetland born last year. He was really small under the fleece. After shearing, the wethers were moved to the arena with Espresso and the ewes to the larger penned area, so I can watch them to check for lambing activity. They are much easier to handle in the area with the sheds once babies have been born.